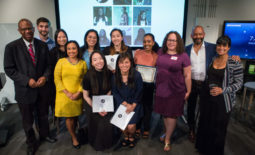 Thanks to AAJA Seattle member Caroline Li, who publishes earthwalkersmag.com, for coordinating this year’s Northwest Journalists of Color scholarship program. Meet this year’s award recipients! One of our scholarship judges said, â€œ Peter is doing something different by going into journalism via the military route. He is also running a paper and taken it to the next level. Kassiopia is journalism major at Seattle University. Sheâ€™s also a volunteer writer at the Spectator, Seattle Uâ€™s campus newspaper and a current intern at the Seattle Weekly. Last summer she participated in a study abroad program to India called, Mass Media in modern India, where she was able to interview the local journalists there. Ilona is a senior at Sammamish High School in Bellevue and plans to attend the University of Washington next year.